"A recent Policygenius survey found that one-third of Americans with car or homeowners insurance haven’t subsequently shopped around for better coverage." Welcome to Day 16 of our 30-Day Easy Money Makeover! Every day in April, we're bringing you strategies to help you improve, and feel more confident about, your money situation. Follow along and see the rest of the calendar here. While securing insurance would seem like a one-and-done task, it turns out occasionally re-shopping for it can save you a lot. If you’ve had the same insurance for a while now, you’re not alone. 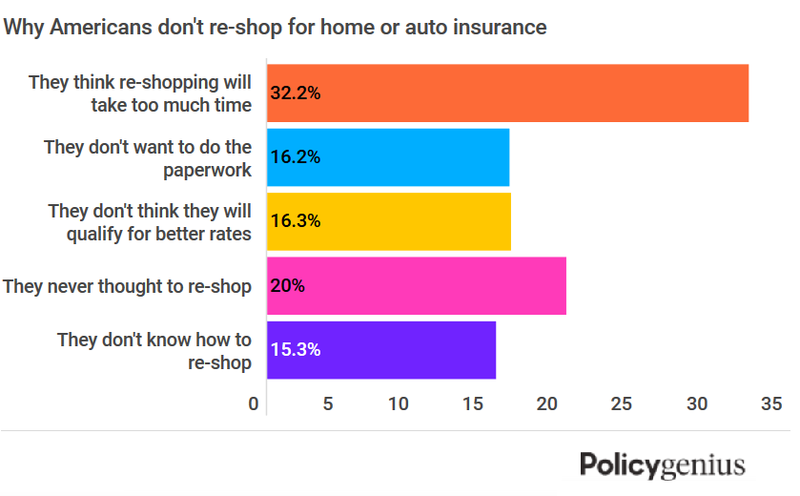 A recent Policygenius survey found that one-third of Americans with car or homeowners insurance haven’t subsequently shopped around for better coverage. Those who do seem to like what they find—42% end up switching policies. The savings could very well add up. On average, good drivers who re-shop their car insurance could save close to $417 annually, according to a 2017 NerdWallet report. That's extra cash you could funnel toward important financial goals, like chipping away at debt, topping off your emergency fund, or investing for retirement. Instead of leaving money on the table, read on for the best ways to compare quotes and maximize your overall savings. Thanks to the internet, you can compare quotes and find deals online without losing a lot of time. Sites like The Zebra and Insurance.com drum up quick, free car insurance quotes based on information like your ZIP code, age, and vehicle type. You can also shop around for life insurance policies on comparison sites like SelectQuote. Adrian Limon, a 47-year-old learning consultant in Monument, Colorado, shaved about $80 off his monthly life insurance premium after jumping on Google and gathering quotes from individual competitors. "I thought, nowadays, there has to be an easier way than talking to a salesperson face to face, then scheduling a medical test," he says. "I went online and it was a fairly self-directed process. I filled out all the information and within 15 to 20 minutes, I got a phone call." Re-shopping homeowners insurance is a little different. Begin by checking your state's Department of Insurance website to see if they publish rate comparisons. If they do, you'll have an insider look at which insurers have the most competitive rates. Alternatively, you can check out sites like NetQuote and Insure.com. Want someone else to do the legwork for you? Independent insurance agents represent a variety of insurance companies that they've already vetted for factors like claims service, financial stability, availability of coverage, and customer service. "The agent gathers all of your information, then searches the marketplace for the best coverage for you," says Michelle Rupp, owner of NRG Insurance in Seattle. "And it costs you nothing more than doing it yourself." Mackenzie Richards, a 29-year-old financial consultant in North Kingstown, Rhode Island, saved close to $1,000 per year after enlisting an independent agent to shop around for a new car insurance policy. The kicker? He also tripled his coverage. Richards ended up switching from a major carrier to a smaller boutique insurer with strong ratings. "It didn't really take any work on my part," he says. "I gave him my information and he came back to me about a week later with his recommendations." You can connect with local independent agents via TrustedChoice.com or the Independent Insurance Agents & Brokers of America. Getting the best insurance coverage is about more than finding the lowest quotes. When comparing policies, make sure to read the fine print. How does the insurer handle claims? Are there any exclusions that could impact you down the road? It's also wise to look into customer reviews to get a feel for how they treat their policyholders. In the event you have to file a claim, the last thing you want is a headache-inducing process. One more thing: When re-shopping insurance, take a hard look at the coverage and deductibles. A low monthly premium may translate to bare-minimum coverage or a sky-high deductible, and you don’t want to be caught off-guard when you need a little help. Your goal here is to set yourself up for savings, and it can certainly pay to do your homework. Check out Tony Robbins says these are the 3 biggest reasons investors fail via Invest in You with CNBC + Acorns.